By most measures, Bryce Harper is not having his greatest season. Sure, he’s got 23 HRs and 54 RBIs, but he’s batting .214, his OPS is .833 and his team is hovering at 48-48. Despite the preseason hype about the Nationals, the Phillies and Braves are battling for NL East. That being said, Bryce Harper’s performance at the Home Run Derby was the most exciting event of the MLB season thus far and is the only thing getting the national sports media to talk baseball. Harper took an already entertaining Home Run Derby to a new level. He trotted out in his home ballpark all America-ed up; stars and stripes knee high socks, arm sleeve, headband and bat. The opening ceremonies included a full scale firework display and the participants looked like they struggled to breath in the cloud of smoke that was left behind. Going into the Derby, it was a little disappointing last year’s winner, Yankees slugger Aaron Judge, was not defending his title, but it turned out to be more memorable than anyone could have expected. Everything about this year’s Home Run Derby was exciting. Kyle Schwarber and Alex Bregman’s battle in Round 1, which prompted Justin Verlander to run out an coach his teammate as he made a near comeback. In the Round 2, Schwarber came from behind to knock off the Phillies’ Rhys Hoskins. All this paled in comparison to Bryce Harper blast nine dingers in ten pitches in the final 47 seconds of the Final Round. He broke the tie to win the Derby in his 30 second bonus round, earned by launching two homers over 440 feet. Harper and the Nationals home crowd erupted. To add to the story, Harper’s father, Ron Harper, was pitching to him. A father pitching balls to his son on national television captures so much of the lure of baseball; it could not have been scripted better. The imagery, intensity and drama was all there. And for one of the first times in recent memory, the national sports media turned its attention away from NBA free agency and the NFL, and got really excited about Major League Baseball. Clay Travis, host of the national radio show Outkick the Coverage, drew a very interesting comparison between Bryce Harper in the Home Run Derby to Michael Jordan in the NBA Slam Dunk Contest in 1988. Like Harper, Jordan was 25 years old and had yet to lead the Bulls to an NBA title. He achieved stardom well before his major career success. Travis astutely observes that MLB is a very strong regional sport, but has difficulty finding stars that transcend their market. He suggests that Harper’s performance on the national stage has propel him into the national spotlight. Skip Bayless, co-host of Undisputed on Fox Sports, called Bryce Harper’s performance “all-time box office” and “electrifying.” Colin Cowherd, host of The Herd on Fox Sports, took a break from his seemingly endless coverage of NBA free-agency to brag about Harper’s performance. All three examples are significant because these shows give very little air time to baseball. 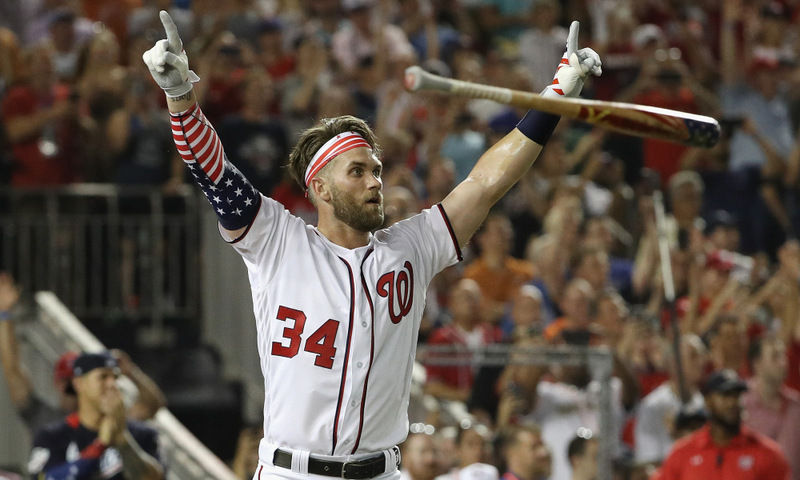 While baseball fans are interested in trade deadline moves, who wins the tight division races and whether or not Mike Trout wins his third AL MVP; the sports media is covering Bryce Harper at the Home Run Derby. Bryce Harper may have put himself in a very unique situation, as he finds himself a free agent at the end of the 2018 season. His Derby performance could be the jolt he needs to surge in the second half of the season. And despite the season Manny Machado is having, Harper is still likely to be the player in the offseason that generates the most interest on the free agent market. As Cowherd points out, owners think about ticket sales. And despite that fact that Mike Trout is the best player of this generation, Harper has received more national sports media coverage as a result of his Home Run Derby performance than Trout has the entire season. There are a lot of criticisms of Bryce Harper and some are deserved. However, is there another current star who has the ability to captivate a national audience like Harper did on Monday night? Is there another player right now who can attract the casual fan to the game of baseball? Arguably, Aaron Judge can do this. Like him or not, Harper has the swagger and charisma to be the superstar MLB needs. The most interesting question following the 2018 season might have just become, where Bryce Harper signs in 2019. ← Previous Story Can a New Rays Ballpark Help Build a Stronger MLB Culture in Tampa Bay?